Because it is rather indulgent, I decided to go with a classic cupcake, as opposed to a chocolate one and then use a rich double choc cookie dough instead of peanut butter. Every time I see the method description "...just beat in a bowl over a pot of simmering water…” I head for the hills, thus, in my ability to avoid such a task I have used a cheat’s marshmallow frosting, no simmering water or cream of tartar required! Preheat oven to 180°C (fan-forced). Line a 12 hole cupcake tin with cupcake papers. With electric beaters, beat eggs, butter and sugar until well creamed. Add the vanilla, then approximately 1/3 the milk and 1/3 of the flour, and beat in well. Repeat until all the milk and flour is added. Divide batter evenly between the 12 cupcake wells, and bake for approximately 15-20 minutes, until a skewer comes out clean. Lovingly adapted from the ‘double chocolate cookies’ recipe in Simple Essentials: Chocolate by Donna Hay. Sift flour and cocoa into a small bowl and set aside. Place chocolate, butter and sugar in a microwave-safe jug. On medium-low power, microwave in 1-minute increments, stirring each time, until completely melted and combined. Do not over-heat otherwise the chocolate may burn. Once chocolate mixture has cooled slightly, add the vanilla and egg, and mix-in thoroughly. Then, add in a little of the flour mixture to the chocolate mixture and completely combine before adding more flour. Repeat this until all the flour is added and combined. Roll the dough into balls of your desired size (mine were about 3cm in diameter). You will only need 12, so any leftovers can be eaten (recommended) or stored in a container in the fridge for use as cookie-dough pops (equally recommended). Lovingly adapted from the ‘home-made marshmallow crème’ recipe in Whoopie Cakes by Susanna Tee. Using an electric mixer, beat egg whites, syrup and salt on high speed until thick and doubled in volume. Add the vanilla, and beat in well. Slowly add the sifted sugar whilst the mixer is on a low speed, until well combined. Place ball of cookie-dough onto the top of each cooled cupcake. Then using a piping bag with a large nozzle hole, pipe marshmallow in a circular motion, stating at the cupcake and working your way up, around the cookie-dough. Use a blowtorch to toast the marshmallow. Can’t give advice on this aspect as I don’t have one in my possession…we attempted using matches (not recommended), was a rather epic fail. Makes them taste bad, and took about a million of them to achieve a faint brown colour. If you don’t want to do all these parts in one day, the cookie-dough balls and cupcakes can be stored in the fridge, and then assembled when you are ready to eat them in the next day or so. 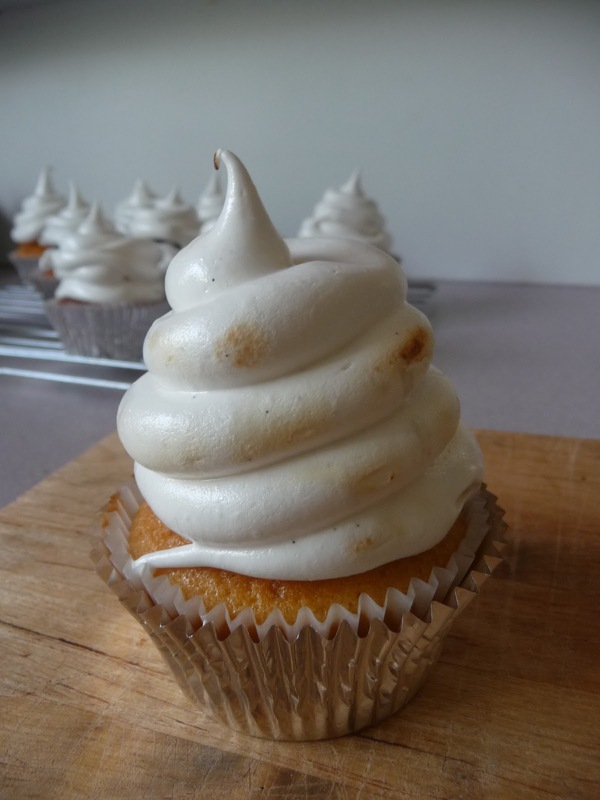 If you are lucky enough to have leftovers, the assembled cupcakes can be stored in the fridge for about 3 days, after that, the marshmallow starts to separate and go a bit gross.